The following information pertains to Williams sound/speech boards as used in Level 6 and Level 7 pinball games (1979-1984). 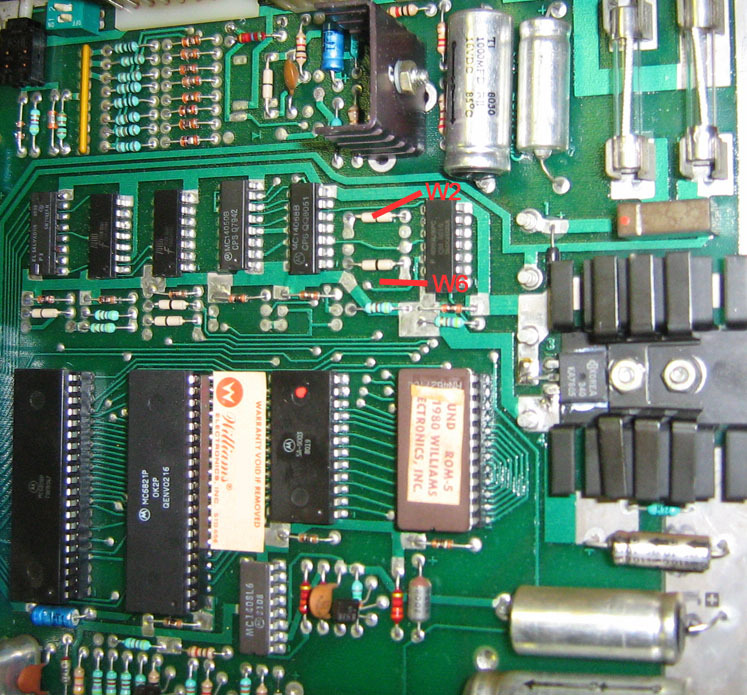 Sound ROM Chip: These boards used a chip at location IC12 for generic game sounds. This was usually labeled "Sound ROM 1", or "Sound ROM 2", etc., up to "Sound ROM 5", depending on the game. This chip was often a masked PROM chip, as installed from the factory. When replacing with a standard EPROM replacement chip, you may need to change jumpers on the board, depending on what type of chip is being replaced. Below is a list of jumper settings for various types of sound ROM chips that can be used (also listed by game name). If you need replacement ROM chips for your game, be sure to check our ROM Chips Page. We have all sound and speech chips in stock. Videos: Robotron, Joust, Bubbles, Sinistar (cockpit rear). See your game manual for additional jumper locations/settings, if needed.